Not everything can make it into the portfolio. General rule is said to be that “your portfolio is only as strong as the weakest project“. But there is some pretty cool stuff I’ve done in the past and I’d like to feature it somehow, even if I can’t put it in the main portfolio. 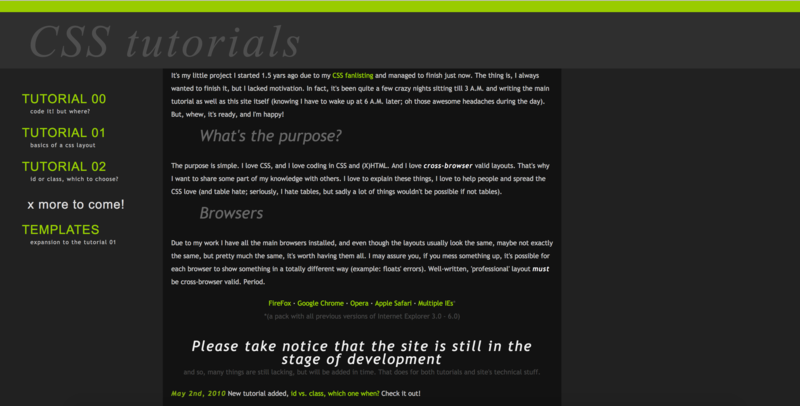 So here’s the first one: CSS Tutorials created in 2010. When I was 16, I got really into web design, just small personal sites, blogs and all that. And I got sooooo hyped about CSS which allowed you to modify just about anything in the layout, colors, structure. I has super into CSS. Back in high school (senior year most likely) I asked my IT teacher to have a lesson about CSS. I wanted to let people know how easy it is to make a basic website. And that was also the reason behind creating CSS Tutorials some years later. At the time I was an active member of The Fanlistsings Network. 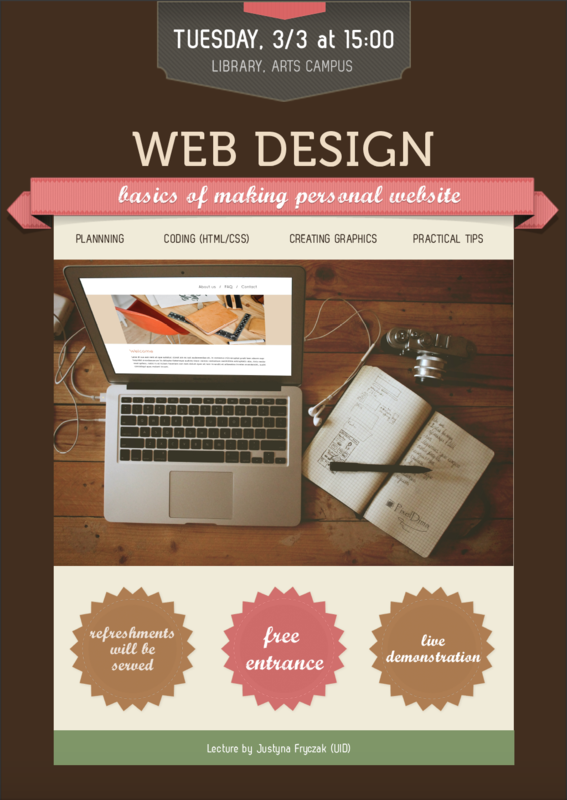 There was a decent amount of people seriously pursuing web design, but most of us were hobbyists that just wanted to have that one small site. Looking at how some people mishandled the code gave me the idea to create CSS tutorials. I never planned it to be a big site. I wanted a cozy feeling of my own personal project teaching people the absolute basics. Building it was quite tricky in itself. I wanted a fixed top and sidebar stretching over the full height of the page, while only the content would be scrolled. Oh, and a sticky footer. I remember that figuring that out gave me quite a headache, that was before HTML5 and CSS3. I was also very set on making everything W3C valid, so no dirty cheats to make it look like I wanted. The site never really spread its wings. I probably didn’t have time to write more tutorials or my focus shifted elsewhere. Nonetheless, I’m proud of my small project. Not that it was the pinnacle of my skills in design or CSS, but because of the idea of making a tutorial site. In the years to come I would have mentioned it as a resource to the people who asked me about the basics of coding for web. In fact, the whole reason why I’m writing about it now is because I mentioned it to a classmate just a few months ago, she suggested I include it in the portfolio. Ever since I also volunteered to give two lectures about the basics of web design at my university (in 2015), one for my classmates and one open lecture at the university library. I love HTML and CSS, but these days I don’t get to dabble in that as much as I used to when my focus shifted more towards graphic design for print and user interfaces. However, this portfolio is one big coding project for me. The biggest one so far. I’m as excited as I am scared. Feeling greatly out of practice, and not up to date with new technologies. But it’s time to change that! My name is Justyna, I’m a student in interaction design. This blog is a way to highlight some of my work in progress, recent small projects, sometimes fishing out some interesting things from the past and sometimes share my reflections on things I’m involved in.